The book is now available direct from Amazon.com >>Here<< and also for digital download on Kindle, Nook and iPad. Click back cover to view enlarged version. This book is neither just about Marketing or Public Relations. Its purpose is demonstrating the links between Marketing and Public Relations. The originally published articles that make up the book’s chapters, were written to help people bridge the often serious gap between professional specialties and understand how to become better PR and Marketing business team players. The people in both areas need each other, most often work closely within organizations and can only perform well when understanding exists. In spite of financial management (bean counters) believing they’re in charge, the whole purpose of a business is Marketing. Discovering needs, managing product or service creation, promoting, pricing and delivering those “goods” to people is what Marketing does. That finance people place Marketing as an overhead expense is like the scorekeepers running a baseball game! Marketing is the brains of the outfit. Without its guidance, vision and understanding, the whole game of business is meaningless. Its like a military force without officers or the proverbial ship without its rudder. Public relations, an aspect of promotion, is a sophisticated and highly cost-effective way for Marketing to express its brand and products values to the market. It brings together several key disciplines, with story telling, hopefully non-fiction, being paramount. There are too many examples of PR definitions for me to spend more time inventing yet another. For the purpose of this book, let’s call PR the voice of marketing. Just as the brain controls our voice, there is an intimate connection between these two business functions. Unlike the biological analogy, in business, marketing people need to understand PR and PR people need to become marketing savvy. The two sections of this book aim at helping improve that joint understanding. It’s a bit more of a book for marketing people to learn about public relations. Most of the articles making up the chapters were originally written for Sales & Marketing Management, Marketing Profs, The Business Marketing Institute and others. However, working PR pros will also find value in what’s covered in the Marketing section that can help them in their specialty and perhaps help them work with Marketing to create more effective PR campaign strategies. There’s also some content on PR agency/client relationships that will be insightful to both kinds of readers. When each member of the business team understands the other’s objectives or better still, creates a seamless relationship, then the serious game of business is played far more effectively. Please read and enjoy this book with the goal of your becoming a better player. 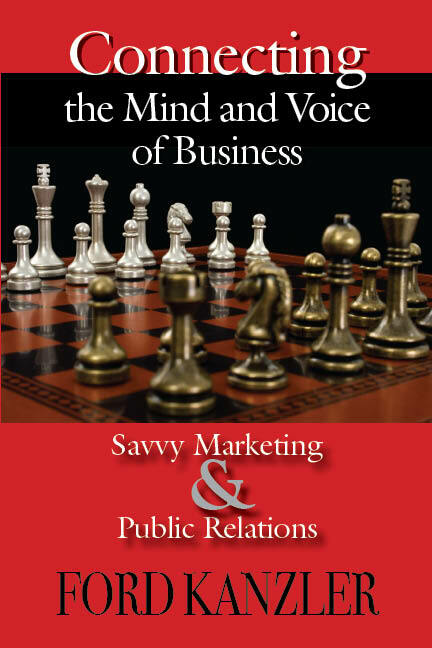 Public relations guru Ford Kanzler has just released a new book, Connecting the Mind and Voice of Business. As with all of Kanzler’s work, the book takes a pragmatic approach to the rapidly changing world of PR and business communications. As only he can do it, Connecting is an excellent read and source for the seasoned practitioner, the novice and the student. In keeping with today’s short attention spans, the book is organized into concise, easy to read topics and chapters making it interesting, fun and very informative. The insightful case histories are also short and to the point. You get the idea without the voluminous text so common in case studies. 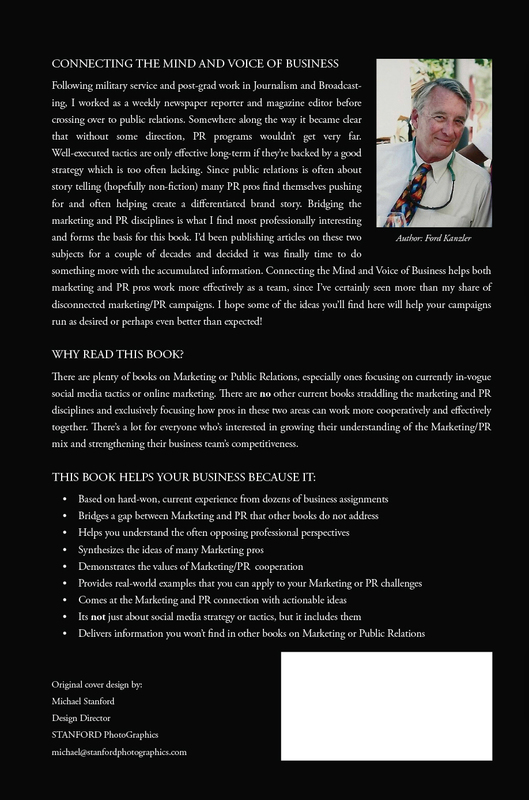 The premise of the book addresses the age-old dichotomy of marketing and public relations. Why can’t they get along? While these are two vital functions to corporate success, they have never collaborated to the extent they should. I believe this is due to management who somehow have never fully understood and accepted the role of either function. Part One of Connecting reiterates the basics of the public relations business stating with Ries and Trout’s Positioning and brand differentiation. So critical, yet so misused. The recap goes through the key functions of strategy, thought leadership, measurement and the frequent reason for failure, lack of execution. Here Kanzler correctly places the role of objectives and strategies on the marketing function. Ideally sitting at the right hand of management, marketing determines what the organization must accomplish and how they are going to go about it. Again, an excellent review even for the most experienced professional and a must read for all C-Suite executives. Part Two provides a variety of actual cases studies on both successes and failures. It is an excellent collection of what happens when you do it right and the results of doing the job wrong. Short, concise, to the point. Then Part Three address today’s public relations, what it is and what it isn’t. Kanzler delves into a life-time of experience in how one must manage one’s public perception and opinion or be brought to the ground by the same public opinions and behavior. With the precision of a surgeon, the author presents 20 of the most influential, and many times, destructive practices found in business public relations. I particular recommend the story telling, 10 Laws of Tech PR, 7 Deadly Sins, Engineers Can Do PR Too and What’s Really New in PR. I’ve experienced them all, and he can save the reader of Connecting much pain and suffering. He concludes with a classics list of recommended reading. Anything Al Ries has written is well worth the effort. Connecting the Mind and Voice of Business is a must read for anyone in business. Kanzler presents traditional, mainstream media and follows its warp speed evolution to today’s always on, always connected digital world. Do yourself and your company or client a favor, read this book. Practice what it preaches.